For the second time in three days, I saw someone walking a leashed-kitty down Alabama Street. The previous occassion, passing by on my bike without camera or smartphone, no photo was possible. But this morning, I hauled out for an early-sun jaunt, with Leica Q in tow. Just beyond Madison, approaching Mission, I came upon a woman walking her slim, quickly-striding cat. I asked to shoot pics of the beastie—Bella. She was more than willing and didn’t seem to mind my lying down on the street and sidewalk; she apologized about the shorthair moving so quickly. I observed great determination and will in the pace. 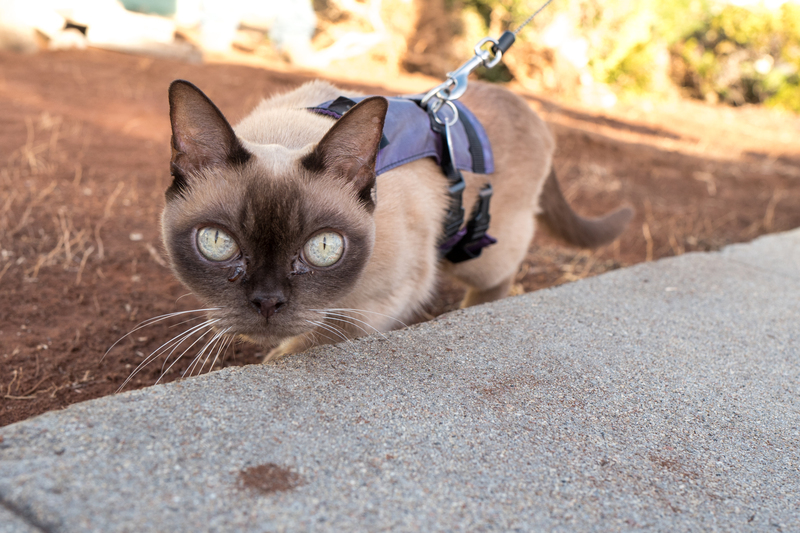 Bella’s owner describes the 13-year-old Burmese’s diet as “raw” and “extreme”. The feline gets mouse (not live) for breakfast. She also dines on quail later in the day. I don’t recall the other dietary delights, but they have something to do with animal parts. For sure, the more “natural” eating, as the owner explains, helps keep the pet slim. Hehe, maybe a few humans could learn something about good eating habits from Bella’s low-carb, high-protein menu. The Featured Image, and its companion, come from the same original portrait but cropped and edited differently. 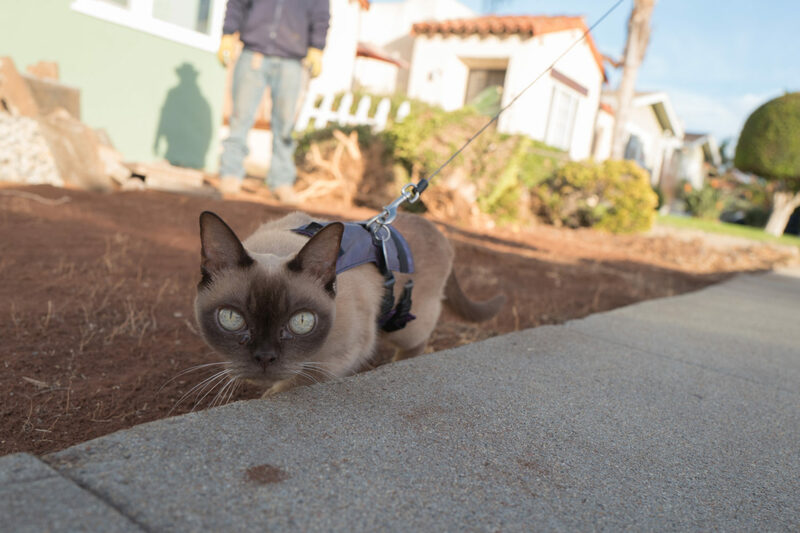 A workman in the background unintentionally photobombs the shot—and why wouldn’t he stop to look at a cat on a leash and some dude lying on the sidewalk with a camera? I deliberately blew out the hightlights and whites for the close-crop. Vitals, aperture manually set for street shooting: f/5.6, ISO 100, 1/125 sec, 28mm; 7:28 a.m. PST. Uncharacteristically, I added another portrait, but shot with iPhone X, on Dec. 14, 2017. Exhausted from her leash-walk, Bella is carried after visiting Itchy Valentino. 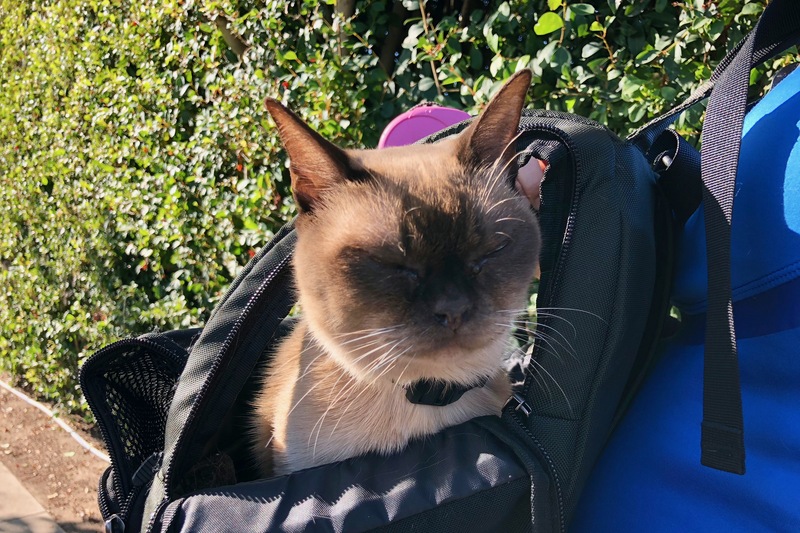 Burmese generally aren’t friendly with other cats, her owner says. But Bella rubs noses with Itchy, the two talk, and they generally seem to enjoy hanging out together. Vitals: f/1.8, ISO 20, 1/239 sec, 4mm; 10:15 a.m. PST. Blasts from the past: Scruffy, Roly Poly, Woo, Skull, Biscuit, The Colonel, White, Chipper, Frisky, Stretch, Needy, Farfisa, Mates, Hunter, Pee-Pee, Blue, Blue Too, Bonded Pair, Patience, Fess, Jumper, Frenemy, Looker, Cozy, Scout, Lurks, Skit, Mini, Betty, Black and White, Stalker, Bell, Chill, Sammy, Scratch, Poser, Star, Grey and White, Watcher, Herman, Comet, Roman, Willow, Chub, Nimbus, Watson, Lilo, Kit, Pepe, Twilight, Sebastian, Spot, Booger, Ash, Veruca, Riley, Mellow, Bonde, Flower, Glass, Black, BeBe, Fang, Bruce, Siamese, Pounce, Tortie, Haiku, Fraidy, Peso, Daniel Tiger, Dusk, Stride, Dainty, Spry, Tabby, Betty Too, Still, Levi, Shadow, Sophie, Wink, Ferals, Momma, Charlie, Tux, Cool, Benny, Jellicle, Itchy Valentino, Goldie, Nine, Amanda, Siesta, ChaCho, Charlie, Too, Mika, Crystal, Seeker, Mittens, Dancer, Smokey, Monkey, Captain Blackbeard, Season, Maven, Tink, Chunk, Curious, and Hanoi.